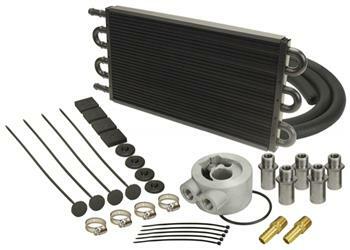 Derale Engine Oil Cooler - 7000 Series UNIVERSAL - Dezod Motorsports Inc - Home of the automotive performance enthusiast since 2002. Adapter Thickness 1-3/4" or 2"
Remote Filter Landing 2-1/2", 2-3/4" or 3-1/2"
Perfect for stock to mild street use, this universal 6 pass high capacity copper tube/aluminum fin engine oil cooler kit can not only reduce oil temperatures to help extend the life of lower end components and oil life, it also helps reduce coolant temperatures. This universal kit includes engine sandwich or spin-on adapter, hose and everything you need to install on most passenger vehicles.